What a charming anthology. Bought it at Flame Con and have been picking through it, there's lots of cute stories! This was great. I especially loved the last one. This was an okay anthology, though none of the stories really jumped out and grabbed me. Most of the stories I did like were just too short and I wanted them to go on longer, but that is usually an issue in anthologies. I would say it's worth reading, just don't expect anything too exciting? I thoroughly enjoyed this. It was wonderful to see various orientations, body types, skin colors and able-ness as super heroes. Some stories were a bit heavy handed, but that's forgiven when seeing the representation presented in a genre that typically doesn't represent diversity. These are our stories and they are gorgeous. I wanted to see multiple chapters of several of these. I highly recommend this people who enjoy the super hero genre and want to see a more diverse representation of who can be seen as super heroes. As with any anthology, the stories are hit and miss. The common queer lit theme of "concealing and revealing identities" lends itself well to the superhero genre, and I found that the pieces that engaged with this theme directly yet creatively were the most successful. Sara Goetter's "Just A Sidekick" is a major standout story, and I think it's well worth the price of admission. 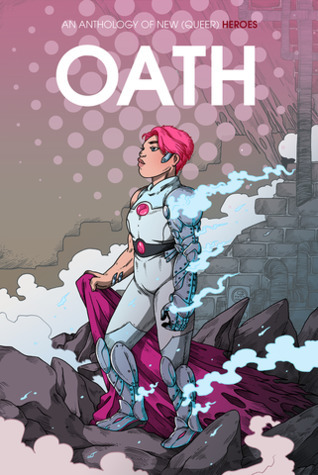 This anthology of queer superhero comics was accomplished and diverse. Some of the stories were sweet, enjoyable reads, while others were tightly paced narratives about (secret) (powerful) identities. Not every comic knocked it out of the ballpark, but I'm still super glad I picked this up at SPX, as it introduced me to many new comic creators.